The National Housing Act of 1934 created the Federal Housing Administration (FHA), which was established primarily to increase home construction, reduce unemployment, and operate various loan insurance programs. The FHA makes no loans, but it guarantees loans through private lenders, and it has helped millions of people buy property and re-finance existing loans over the years. FHA loans are highly popular with several types of borrowers. This is especially the case for first time home buyers who want a home loan with easy qualification guidelines, and a low down payment. The FHA (Federal Housing Administration) does not issue loans, but rather insures them. You must use an FHA approved lender in order to get an FHA loan. If you would like to speak with an FHA lender, fill out this form , and a loan representative will contact you to answer your questions. These are the standard FHA loan requirements. 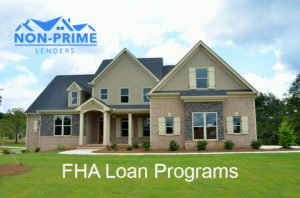 Each individual FHA lender may have their own requirements that you must meet in order to obtain an FHA loan through them. The only way to find out exactly what will be required of you, is to get pre-approved for an FHA loan . If you are approved, you will receive a loan approval letter that outlines the exact requirements that must be satisfied prior to your FHA loan closing. None-PrimeLenders.com is the leading resource for finding non-prime mortgage information, including details related to programs, guidelines, and lenders.